Well, my post Gambler prediction of a greatly extended riding season were sideswiped by a brutally cold and wet fall. 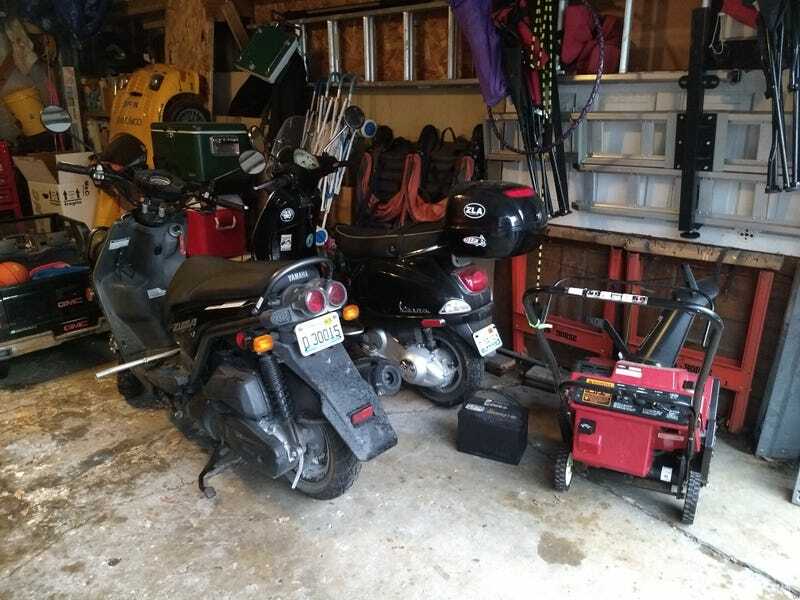 Today it finally made it back into the 40's, and was just drizzling, so I seized the opportunity to not watch the Bears lose and finally winterize the scooters. My winter tires have been on the truck for weeks now, when they usually don’t go on until Thanksgiving. I even decided to replace it’s battery, since it’s six years old now. I also took the last few parts I want from the RallyMetro, except for the StupidWing. If I get a chance to take that off (it’s going on my shop wall), I’ll probably haul that to the junkyard this week. Oh, the snowblower. That friggin thing won't start again. Any Chicagoland Oppos want a cheap blower? I'm sure a carb clean and a spark plugs and will get her going again, but I'm sick of screwing with it. Time to treat myself to a new one.